Hop on over to the Houston SPCA and find your honey bunny! All rabbits at the Houston SPCA will be available to approved adopters for a $10 adoption fee from Saturday, August 9 through Sunday, August 17. All rabbits are spayed / neutered and ready to go home with you on adoption day. Rabbits are intelligent, curious and affectionate companions. They prefer to live indoors and can be litterbox trained. 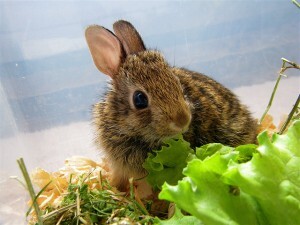 Indoor rabbits can live up to 10 or more years. “[Rabbits] can be trained to use a litter box, they’ll come when called, and some will engage their owners in a daily game of tag! Domestic rabbits are delightful companion animals. They are inquisitive, intelligent, sociable and affectionate—and if well-cared for, indoor rabbits can live for seven to ten or more years. The Houston SPCA, 900 Portway Drive, is open seven days a week Monday through Friday from 11 a.m. to 7 p.m. and Saturday and Sunday from 10 a.m. to 6 p.m. to make choosing the adoption option as easy as possible! For information and tips on taking care of rabbits, see the ASPCA (American Society for the Prevention of Cruelty to Animals) info page on rabbit care.